Synopsis: High school will be a breeze for Jenni Kershaw - if she lives long enough to enroll, that is. Jenni's ordinary, eighth grade life becomes a thing of the past when her science class goes on a field trip. Armed with only their notebooks, MP3 players, and wits, Jenni and her classmates are unknowingly transported to another world. There they encounter amazing creatures, some of which think a kid shish kebab would be a tasty treat. But they soon find the greatest dangers they face may come from themselves ... Follow Jenni and her class on their extraordinary adventures in their fight to discover who - and what - they really are. I wasn't sure what to expect when reading "A Measure of Disorder" because the description is pretty vague and I hate to say that I'm not really a fan of the cover, but the book pleasantly surprised me. Tucker created a magical world and characters that I cared about. I loved how they were able to find their true identities in another world and I felt this was a really concept. I kind of wonder how Jenny's identity will play out in the rest of the series. I know that probably didn't make much sense to most people, but I'm trying not to spoil anything. I also liked how Crank's character explores the idea of "The Other" (basically someone who doesn't fit into the parameters of the society they live in), which is a topic I love to explore in books. I didn't really like how the book was told through multiple perspectives and I had trouble keeping up with all the characters at the beginning. By the end of the book I was used to it and stopped noticing, but it did slow down the book for me. I am curious to see what roles the characters will play in the series. Even though it started off a bit slow because of all the characters, the plot really kept me hooked and I flew through the last hundred pages. I just had to know what was going to happen next. I really enjoyed "A Measure of Disorder" and would recommend it to anyone who enjoys fantasy and adventure books. This is a book that I think would have appeal to readers of all ages. The ending of the book really surprised me and I am excited to read the next book in the series. Click here to learn more about the series and read a excerpt from the book. * I did receive this book free of charge for review purposes. Synopsis: Since their mother's death, Carter and Sadie have become near strangers. While Sadie has lived with her grandparents in London, her brother has traveled the world with their father, the brilliant Egyptologist, Dr. Julius Kane. I absolutely loved "Percy Jackson and the Olympians" Series so I was psyched that Rick Riordan was coming out with new books based off Egyptian mythology. I have to admit that the book took me a while to get into and that the switching between characters was a bit jarring, but once the pace picked up the book just got harder and harder to put down. Sadie and Carter are great characters. They drive each other crazy like all siblings, but they of course love each other even if there is tension between them. The book definitely made me want to learn more about Egyptian mythology, I haven't studied it since like 6th grade. I love how Riordan sets different scenes at famous landmarks in his books. There were scenes all over the world that are huge tourist attractions already, but it would be cool to plan a vacation based around places in "The Red Pyramid". Maybe you could make it a goal to hit one destination every five years throughout your lifetime, that way you wouldn't have to spend thousands of dollars on travel all at once. Sorry I am getting a bit off topic... ANYWAY! Even though the book was a bit slow, it definitely set up the rest of the series to be action packed. I wasn't sure if "The Kane Chronicles" would feel like "Percy Jackson" all over again, but Rick was able to do some really cool things with Egyptian mythology that sets the series apart. Yes it does have the same action, adventure, and hilarity that "Percy Jackson" has, but the Egyptian mythology is so rich that it somehow feels completely different. I could say a lot about the book, but I'd end up giving away some fantastic plot twists or something. If you liked "Percy Jackson", then you will also enjoy the first installment of "The Kane Chronicles". Check out Rick Riordan's website here to learn more about "The Kane Chronicles" or "Percy Jackson and the Olympians". Synopsis: It's pretty much the only good thing at her urban Philadelphia high school, and everyone plans to make the most of it-especially Ash's best friend, Natalia, who's the head of the committee. Then the faculty advisor is busted for taking the prom money, and Ash suddenly finds herself roped into putting together a gala dance out of absolutely nada. But she has help-from her large and loving (if exasperating!) family, from Nat's eccentric grandmother, from her fellow classmates. And in putting the prom together, Ash learns that she has choices about her life after high school. Prom has everything that award-winning author Laurie Halse Anderson is known for-humor, poignancy, teen readers' tough issues dealt with head-on, and a voice teen readers will recognize as their own. This review is very fitting because it is Audiobook Month and I listened to this book on audio. To be perfectly honest, the only reason I read this book is because it was the only YA audiobook not checked out at the library that sounded remotely interesting, but I am so glad I picked it up. 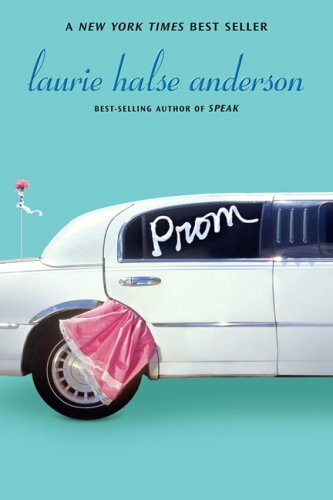 I have heard of other books by Laurie Halse Anderson, but "Prom" was not one of them. I had started to read "Speak" but couldn't really get into it, so I was surprised with how awesome "Prom" turned out to be. I absolutely loved Ashley's character; she had attitude, but she was willing to do almost anything to help out her family and friends. She didn't even want to go to the prom but ended up putting all her energy into trying to save it. Natalia is another great character; her positive attitude is contagious. Honestly, I could probably go off for another page listing all the great characters, but I can just sum it up saying that the book has vivid characters. The plot may sound simple, but Anderson manages to integrate a lot of issues into a seemingly simple story. This is of course a coming of age story, but the humor allows the reader to be distracted from some of the harsher subjects. One could definitely take the time to think about the book more in-depth during or after the book, but the book is a fun, quick read making it hard to put down. Family and Friend dynamics are very important to the story, while Ashley's relationship with TJ also has its place. We all go through our TJ stages and I could definitely relate to falling for a sweet talking guy. It is interesting to see which relationships evolve as Ashley develops into a strong women. This book was a lot of fun and I really enjoyed Katherine Kellgren's narration. She brought the characters to life and greatly contributed to my enjoyment of the book. I will definitely be reading more of Laurie Halse Anderson’s books in the future. I'm not sure which one I'll pick up next, but I'm sure I'll enjoy it. I may even revisit “Speak” to give it another chance.